I couldn't resist it. I had to buy them. I'm sorry, Mrs. Wallet. You had to lose some weight. Fate should not have led me to pet heaven. Last Sunday, we went to find something for my niece. 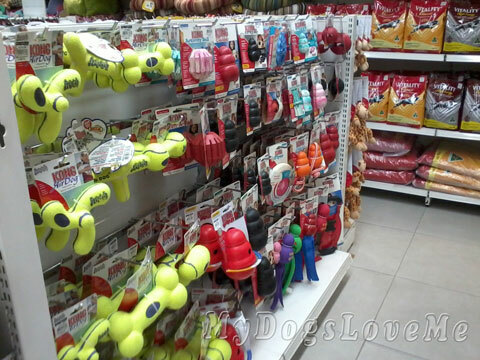 During our journey, we came across... Pet Express, a haven for four legged family members. And my eyes wandered and I went into a frenzied trance where I had to see and touch anything and everything. Pet Express has multiple branches in Metro Manila, Philippines. I mentioned previously that Kongs weren't sold in our city... Well, looky here! My mouth almost watered with all the Kongs they had on display. I was also able to touch one that's similar to Hawky's Mr. Wubba Octopus. My prayers are answered. Kongs, Kongs, and more Kongs!!! You're probably wondering what I bought in their store. Here they are. I really couldn't help it. I was under the influence of an addiction... pet addiction... I had to buy something to commemorate my visitation. The green squeaky toy is currently with Buchi. It's one of the first he is truly enjoying as his old one was too big for his mouth to squeeze. The brown one came from another shop. Have you ever felt so weak and helpless to have given in to the temptation? 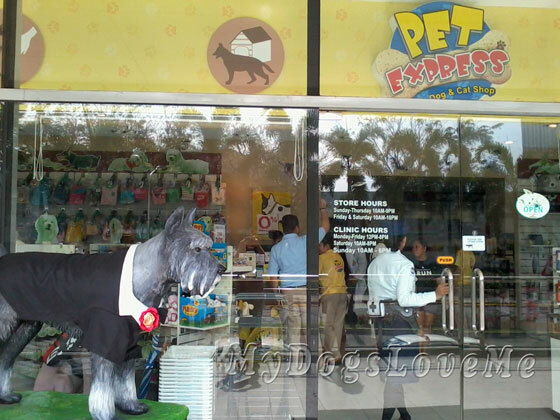 If you're interested in checking out the Pet Express at SM Mall of Asia, just click on the link. Is that a big plastic schnauzer being used as a display outside that shop!!??????!!!! Mum would love that..... can you take it home and send it over??? BOL!! So glad your range of stuffs are increasing....I thought you would buy one! LOL. Hey Rubie, I'm just taking a short vacation at the moment. I'm coming home next week. I don't blame you, I am just the same - whenever I go into a pet shop I always come out with toys for the kids! LOL. I know that you mean. My boyfriend was holding me back in purchasing too many stuff because we were planning to go in another pet center where there were a whole lot of petshops! Daily, I have dogs!! What a great haul you've got there! I'm jealous! lol! I know what you mean. We didn't have this back where I live so I looked like a town person out in the big city! Haha. Now that's an understatement! What a great selection of toys! Guess it's time to send Mommy to a pet shop! Indeed! Let us share the love. Momma cannot go into ANY store that has doggy goods without bringing home something for us...we have her trained VERY well! You have the START of a nice collection of gifties...hint, hint! Thanks for the nice words you left for Michael's birthday. Like most of the WDA he is a rescue. Momma's nephew who came to live with us when his mother did a physical/mental crash and burn (she is now in permanent care), poor Michael, who is autistic came to us angry and suffering from post traumatic stress. With the help of the WDA he finished HS and is now in a community outreach/job training program and is doing VERY well. We are proud of him. Oh yeah! The store where I buy my pet food carries all sorts of foods for special diets. There's treats and toys that I can't find in the Pet mega store, so it's always a treat to go! I think it's a tough addiction for our peeps to overcome - BOL! Yes, yes, yes! I only don't like it if I bring home a toy and it turns into a dud. Yikes...what to do with it? I like Kong toys and I like Nylabone stuff too. They last a really long time! 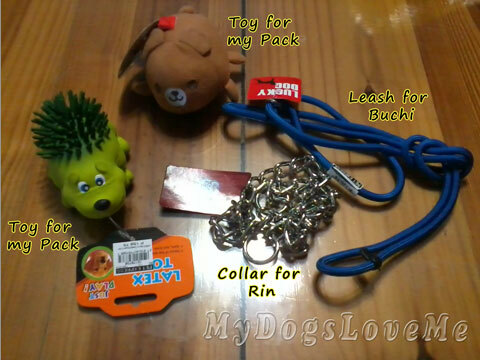 We spend way too much on toys and things for our pups...Im suprised we havent had to go bankrupt, lol! I know what you mean. 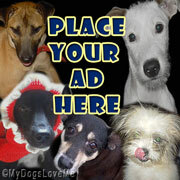 I've kept tabs on my doggy expenses and I was surprised I had that much money. We could have lots and lots of fun at that store!!! Our mama's wallet would definitely be thinner! Glad you got some new stuff! Thanks. Yes, it does force the mommas to go on a diet once they come out with baggies filled with doggy stuff. There are few things more satisfying than a successful shopping trip. Looks like you did very well! Just like you, I'm a shopaholic. Wow what a shop! Mum goes crazy when she goes to pet places, BOL!